Carmel-by-the-Sea is known as a town for art lovers, dog lovers, and those who love to shop. With its ideal seaside climate, its tranquil fairy-tale atmosphere and its well-known art galleries, Carmel-by-the-Sea is the perfect spot for a weekend getaway. Whether you&apos;re looking for a romantic weekend, a weekend of shopping with friends or a weekend with man&apos;s best friend, this itinerary will help you plan your weekend in Carmel-by-the-Sea. Start your weekend at a unique hotel that feels like it was created just for you. One of the most charming aspects of Carmel-by-the-Sea is its storybook inns. Carmel has almost 40 small, mostly independently owned and run inns, each one with its own distinct personality. If you&apos;re traveling with a four-legged friend, you&apos;re in luck; nearly 30 of them accept pets. Whether you&apos;re a steak lover, a seafood lover or in between, Anton & Michel is a fantastic place for dinner. Anton & Michel&apos;s features Black Angus New York steak, pan roasted duck breast, rack of lamb and locally caught seafood. Make sure to start with one of their exquisite appetizers, which feature fresh ingredients and end with a mouthwatering dessert. Dining with your pet? A good alternative is Grasing&apos;s Coastal Cuisine. The food is equally excellent, and it&apos;s pet-friendly. Humans and their companion animals are welcome at Carmel Beach, a favorite spot on Monterey Bay for dog-walking, surfing and romantic snuggling. From May 5 to August 13, this is well in time to watch the sun set, and perhaps admire the talents of some of the Monterey Bay area&apos;s most skilled and enthusiastic surfers. For breakfast, stop at Carmel Belle, a local favorite known not just for its great food, but also for its cozy indoor fire pit. Their avocado toast is delectable, and their hot polenta bowl will melt in your mouth. This morning, you&apos;ll take tours of two of the most important buildings in Carmel. The first is Mission San Carlos Borromeo de Carmelo, more commonly known as the Carmel Mission. The Carmel Mission, established shortly before the American Revolution, was the second mission built in California during the Spanish period and is now a National Historic Landmark. At the end of the 19th century, it was almost abandoned and lay in ruins, but was restored early in the 20th century. It is now considered to be the finest example of a Spanish colonial era mission in California. Docents frequently give Mission San Carlos tours at 10am. If you prefer to browse the buildings on your own, a Mission brochure will give you all the resources you need for a self-guided tour. Just a short distance from Mission San Carlos is another unique Carmel building, Tor House and Hawk Tower. This stone house and tower was built by hand over the early part of the 20th century by poet Robinson Jeffers for his wife Una. Many who visit are swept away by the romantic story of Robinson and his wife. Others are astounded by the hard work and sheer creativity that went into building a two-story stone house and three-story tower, largely with found construction materials and without any power tools. The building fits in harmoniously with its environment and breathtaking views of the ocean, evoking the same spirit as Robinson Jeffers&apos; muscular poetry. Tours of Tor House and Hawk Tower are given on the hour on Fridays and Saturdays only and must be reserved in advance, as tour groups are limited to six people. Make sure to call 831-624-1813 several days in advance to make your reservation. Between the tours and the fresh sea air, you must have worked up quite an appetite. Bistro Beaujolais, located at Carmel Plaza, is the perfect place to refuel. This restaurant focuses on perfectly presented Mediterranean fare. Its pizzas are delicious meals for one (try the Marrakesh Express, which features hummus and is surprisingly good), and its extensive list of entrees features both French classics and fare with a Moroccan twist. The patio seating is a great spot both for people-watching and to dine with your dog. Now that you&apos;ve had a bit of a rest, it&apos;s time to explore one of the things Carmel-by-the-Sea does best - shopping! You&apos;re in the middle of Carmel Plaza, known both for its array of luxury stores and its dog-friendliness, as epitomized by its canine drinking fountain, the "Fountain of Woof." A must see "hidden gem" in Carmel Plaza is family owned and operated Carmel Honey Company. Here you will find one of a kind, specialty gourmet honey products straight from the hives in Monterey County. Sample honey varietals on site or book a "Sweet Experience" in advance with 15 year old owner and beekeeper Jake Reisdorf. And guess what...shopping here supports honey bee research and education! Once you&apos;ve explored Carmel Plaza, it&apos;s time for a long stroll down Ocean Avenue. Fashionistas should not miss Augustina&apos;s, loaded with many top designer lines as well as jewelry and fine furs or The Club which is full of designer clothes and accessories. Spoil your pet with a visit to Diggidy Dog, a dog and cat boutique. L&apos;Auberge Carmel&apos;s Aubergine Restaurant consistently wins awards, and for good reason. Chef Justin Cogley bases his ever-changing menu on the fresh produce he receives from local farmers. Diners can select items from the menu, or ask Chef Cogley to create a multiple-course tasting menu. The 4,500-bottle wine cellar ensures that every wine will be perfectly paired with the food. With only 12 tables, every diner receives individual attention. Enjoy a leisurely brunch at a dog-friendly restaurant with a quaint and cozy atmosphere. Patisserie Boissiere Restaurant is located in a charming building that looks like it was transported directly from the Alsatian region of France. It&apos;s tremendously popular for brunch, so be sure to arrive as soon as it opens. Save room for dessert; their pastries are exquisitely flaky. Carmel-by-the-Sea began as an artists&apos; colony, and the town is still dense with galleries. Begin your artistic journey at Carmel-by-the-Sea&apos;s oldest gallery, the Carmel Art Association, where you can get a broad introduction to the local artists&apos; scene. Gallery EXPOSED specializes in all sorts of photography including contemporary, local, and black and white. Before you leave town, stop for an early dinner at Casanova Restaurant. This charming restaurant feels just like stepping into a well-decorated French country farmhouse. The menu features delectable dishes from both France and Italy, and their hand-dug wine cellar is the winner of the Wine Spectator Grand Award. You won&apos;t need to leave your four-legged friend at home; Casanova also welcomes pets. 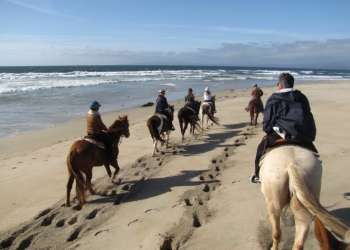 Click here for a list of more itineraries in Carmel-by-the-Sea.